Although superficially the all-black A3+ Epson Stylus Photo 1500W (Artisan 1430 in the US) printer looks suitably different to the two-tone Epson Stylus Photo 1400, under the hood it's a different matter. One of our chief gripes with the Epson 1400 was that it used the Owl Ink cartridges - well the Epson 1500W features the same six-colour dye-based ink system, with individual cartridge bays for magenta, cyan, yellow, light magenta, light cyan and black. Not that there's fundamentally a problem with the Epson fade-resistant Claria ink - the colours are lively on glossy paper and prints are said to last up to 98 years under glass and over 200 years in a photo album. No, it's more to do with the size of the cartridges. The Owl Ink cartridges are also used in some of Epson's A4 photo printers, where their 11.1ml ink capacity makes more sense. Doubling the print size to A3+ naturally means that ink supplies will run down faster and the cartridges are going to need replacing more frequently. It's like putting the fuel tank from a Mini Cooper inside a BMW 5 Series; you're not going to get too far if you push it hard. 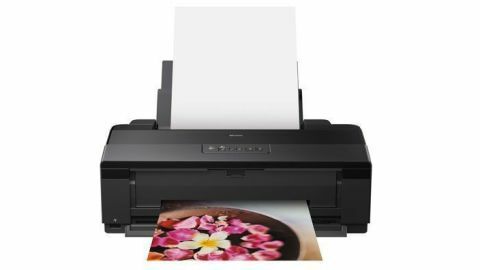 With a street price of around £240 (around $300 in the US), the Epson Stylus Photo 1500W appears good value - the extra 'premium' over the cost of the Epson 1400 gets you Wi-Fi printing functionality. Both models share the same Micro Piezo TFP print head, with 90 nozzles per colour capable of 1.5pl ink droplets, and a maximum resolution of 5760 x 1440 dpi. Neither is a particularly cheap printer to run. The 11.1ml coloured ink cartridges cost £14.21 ($21.99), putting the price per mililitre of ink at £1.28 ($1.98). In terms of paper handling, the Epson 1500W/Artisan 1430 has a capacity of 100 sheets of plain A4 or 30 sheets of Epson Premium Glossy Photo Paper. On-body controls are limited, but ample printer management is offered by the familiar Epson interface when the driver is installed on a computer. Connectivity comes in three forms: USB 2.0 (for which you'll need to buy a cable separately), a front-panel PictBridge port for printing directly from a compatible camera, and Wi-Fi for printing wirelessly from a laptop or desktop computer. Being Wi-Fi compatible means that by installing the Epson iPrint app, images can also be printed from an iPhone, iPad or Android device. Build quality is typically good. The Epson Stylus Photo 1500W isn't going to win any style awards - the design eases towards functional and industrial rather than elegant. But, at 616mm x 322mm x 215mm with the sheet feeder and output trays closed, at least its footprint is relatively compact. That's not to say it's small - this is an A3+ printer after all. Since it offers wireless printing, at least you don't have to have it in the same room. It took us a few attempts to get the printer recognised on our network, although there's a decent, if slightly daunting, online help resource should you come unstuck. The Epson 1500W is quiet when it is running, though, and print speeds aren't disastrous. Epson rates the Stylus Photo 1500W's print speed at 3 minutes 18 seconds for an A3+ print at default photo quality. This is accurate: in our tests, we clocked a standard quality A3+ print at 3 mins 24 secs from the point at which the rollers engaged the paper to the time the picture was ejected. Selecting the highest quality Photo Resolution Performance Management (RPM) setting, we saw the A3+ printing time increasing to 7 mins 55 secs, with an A4 print at the same Photo RPM setting taking 3 mins 41 secs.